Come on in! Cozy up in your very own virtual easy chair while you read about the stories in my burgeoning book menagerie. Click each book cover to go to the book’s details page. Rule #1: Discuss what you like, but troll comments will be deleted at my discretion. Send fan/anti-fan mail here. Rule #2: Please DO put your feet all over the furniture. HOW AMI SUPPOSE TO FEEL!????????? No really I don’t know what do with my emotions! This book my goodness this BOOK!!! I was screaming like a mad woman. Everyone should READ THIS BOOK!! I knew it was coming but I WASNT READY! How is that possible?????? You are. Genius writer. It’s been a while since I’ve been running thru the house screaming in shock! I LOVE IT. But you nearly killed me! Also you left a small cliff hanger which means I need another book as soon as possible! You’ve made an awesome start. I sequel or spin off would be nice. This can easily be a stand alone as well as the start of a serious. Loved it please write fast and tell your publishers to think of your readers. I WILL BE WAITING. <333333333 This comment made my day! Rest assured there is a sequel in the works. Actually, more than one if you count DOWN TO THE LIAR, the Julep e-novella that’s going to be released late summer/early fall. Book 2 is called TRUST ME, I’M TROUBLE and will be out October 13th of this year! Thanks so much for reading and commenting!!! When is “Trust Me, I’m Trouble” coming out? 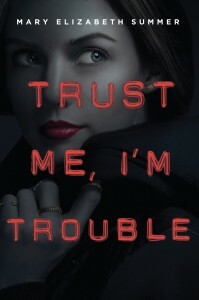 TRUST ME, I’M TROUBLE comes out October 13th! 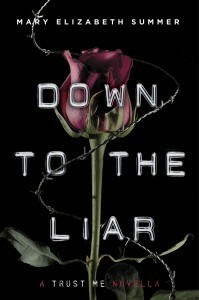 And a Julep e-novella called DOWN TO THE LIAR will be coming out sometime late summer/early fall. 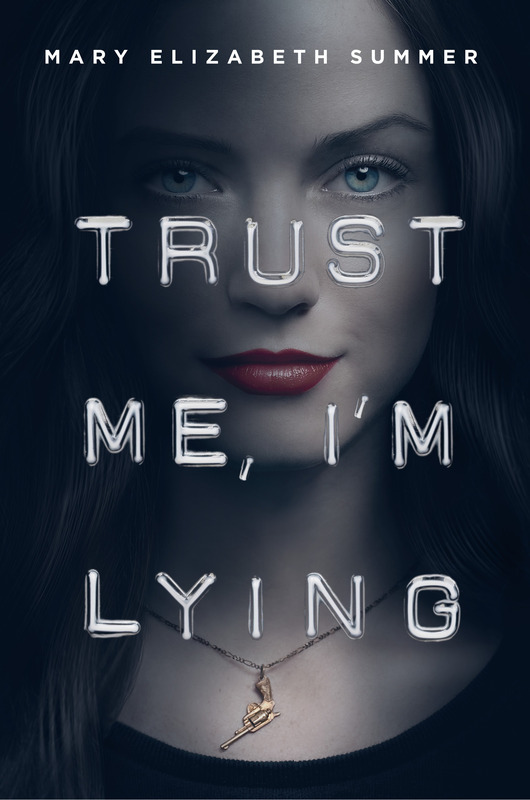 Do you have any plans for making a sequel to “Trust me, I’m Lying”? Yes! The sequel TRUST ME, I’M TROUBLE will be coming out October 13th 2015. And there will be a Julep e-novella released in just a few months. Stay tuned! The sequel as one of my Waiting on Wed. I’m excited for it. I just finished reading “Trust me I’m lying” about five minutes ago and my emotions still feel like stormy sea. This book was absolutely awesome! I love Juleps personality and the plot is really well written. Congrats Mary Elizabeth to this amazing novel and I hope many more Julep books are to be released. This is now my favourite book EVER!!!! I couldn’t decide which emotion to feel, I was crying one minute and smiling the next. And I was so into the character and plot it was like I was julep myself, I felt personally betrayed when she did, angry when she was and I even felt stupid when she did. I didn’t see any of it coming, it was completely uncliche and original. I loved it. It now surpasses divergent and the hunger games on my top books list. And I recommend it to everyone. OMG really??? I’m thoroughly flattered. Thanks so much for stopping by to comment! In case you didn’t know, there’s a giveaway going on right now for a Trust Me, I’m Lying swag pack. If you haven’t entered already (and want to), all you have to do is find the secret stash page on my website (hint: Julep’s real name). Thanks again for your comment! You made my day!! Omg I just finished reading this book yesterday and I can’t stop thinking about it I wish it were a movie. I didn’t know there was a whole to it until today, thank god I found this website. 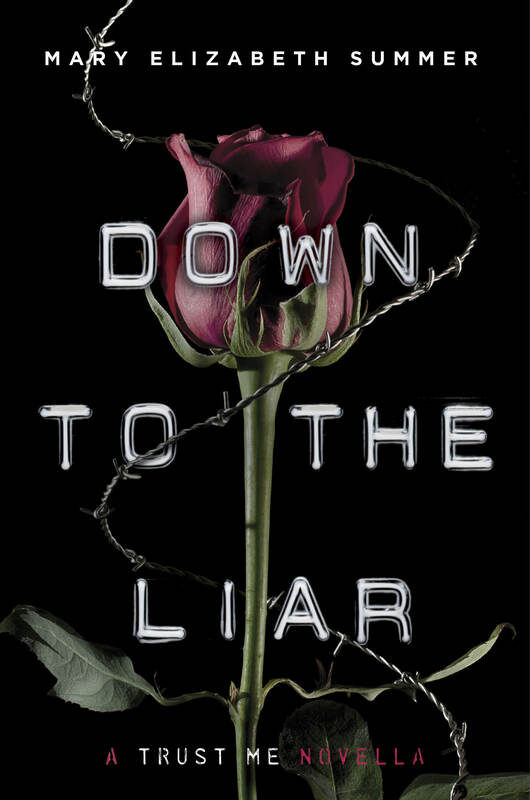 Is down to the liar the second book and trust me I’m trouble the third book? And when do they both come out? Literally just spent my day at the bookstore. I read Trust Me I’m Lying and Trust Me I’m Trouble straight through. Literally amazed. Please tell me another is coming soon!!!!! Oh my word. I just finished the first book in the Trust Me series and I am in love. Oh my heart. I ship Sam and Julep so hard. But is there only going to the second book or are you going to write more? Because I don’t think I can get rid of all my feels in just one sequel. You should keep writing them forever! Thank you so much for giving me a realistic teen crime novel. It was amazing and emotional and a great journey! Thank you so much for your comment. It’s encouragement like this that keeps me going! There will be at least one more book, though I haven’t written it yet LOL. I’m working on it, I promise! Hi I do love your books! They are wonderful! I hope you get the chance to read this. Anyway, I have a question, will there be a third book in this series trust me I’m lying? I’ve read the novella and the two main books but I hope that’s not the end of Julep!! Please let me know. Thank you so much for your kind compliments! I’m so glad you enjoy Julep and want to see her adventures continue. I am currently working on a third installment, so don’t despair! I’m just trying to finish up another manuscript at the same time, so I’m working a little slower than usual. I loved trust me, I’m trouble. I can’t wait for the next one. Do you have a time frame for it yet? Thank you, Tiara! I’m so glad you liked the book. I’m still drafting the third book, so I don’t have a time frame yet, I’m afraid. I’m working on another manuscript at the same time, so it’s taking me a bit longer than the first two. But have no fear! I will be shouting from the rooftops once I get it written. If you haven’t done so already, sign up for my e-newsletter. I’ll definitely update everyone on my progress there. Thanks again for stopping by! So i read trust me im lying when it first came out my good friend Jacqueline got a copy of it from you at a book signing and after she read it she gave it to me to read and said i would love it . now that was over a year ago and it was an amazing book . well i just finished reading trust me in trouble and if i am being completely honest i didnt not expect for it to top trust me im lying . you did an amazing job on this sequel . i started the book and finished it by the end of the day i couldn’t put it down . I do hope you have a third book in mind because if not i must say you should consider it ill be the first to buy it . thank you so much for these books they are a piece of art i will always love . Will the third book be out this year? I adore this series so much and the wait is pure agony!